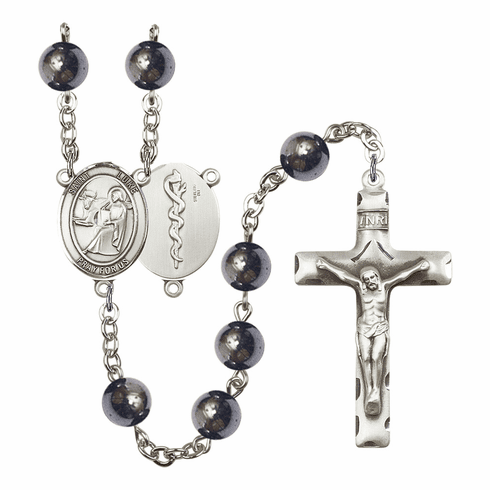 These beautiful gemstone Light Rhodium-Plated rosaries comes with a lovely crucifix and your favorite patron saint centerpiece. All of the patron saint rosaries are made in the USA and come in a deluxe gift box. Our Christian prayer rosaries are handmade by a group of talented artisans here at Bliss Manufacturing in Rhode Island. Each rosary is custom made at time of order. Please allow 3 to 5 business days before shipping. Patron saint rosaries can be engraved on back of the centerpiece with your own personalized message; a standard engraving charge will be applied. Bliss Manufacturing rosaries come with a lifetime guarantee against tarnishing and breakage. These rosaries are a wonderful gift to celebrate a Birthday, Confirmation, Baptism, Christmas or to celebrate one?s Faith. Engraving. Click for engraving information. Engraving. is available up to 3 lines 12 Letters each on Centerpiece. Available Type Fonts: Roman, Helvetica, Script, Monogram, & Monogram Circle. Monogram Fonts are limited to three letters. The back will be blank before engraving. Add words to be engraved in the box on this page and if you are using letter accent in your words please also add inscription at checkout in comments box. If your item(s) is engraved and/or personalized, the order is considered a final sale. So please double check your inscription to be engraved before you place the order. All orders that require engraving usually take 1-5 days to ship after the order is received.